As the basil in my garden grows fuller this time of year, I start dreaming of pesto. Using walnuts in place of pine nuts makes it more affordable, and the walnuts add their own unique, pleasant flavor to the dish. Pesto is simple and easy to make, yet it's just bursting with flavor. You can even freeze extra pesto during the height of basil season to preserve a little taste of summer for the cold winter months. 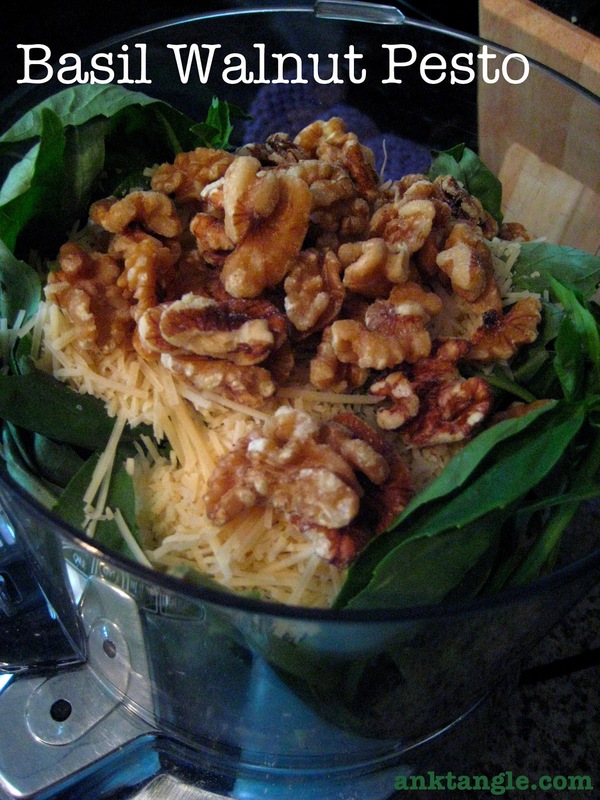 Add basil, garlic, walnuts, cheese, and salt to your blender or food processor. Pulse until well blended. Incorporate the olive oil, blending as you pour it until the mixture forms a thick puree. Mix into freshly cooked pasta and serve immediately! (This makes enough pesto for 12 to 16 ounces of pasta.) My favorite gluten-free pasta brands are Ancient Harvest quinoa pasta and Tinkyada rice pasta. Pesto can also be made with any hearty leafy greens like kale, chard, or beet greens—yet another way to handle the abundance of greens this time of year! I like to keep at least ⅓ to ½ cup basil in the mix when subbing in greens for the rest, to keep some of that delicious basil flavor.. It's totally up to you! What's your favorite way to eat pesto? I'd love to try your ideas! Amazon links in this post are affiliate links. to help maintain this site at no cost to you. Thank you so much for supporting Anktangle! Please see my full disclosure policy here. Pretty good post.It looks tasty dish.Its a healthy food and I want to try it.I really happy to read your post.You are sharing this good recipe details.Thanks for sharing.Custom essay writing service is focus on developing writing ideas and gives you a chance to share important information with readers. I would really love to try out this recipe. Just in time for my www.edubirdie.com review break.